Peru's Boiling River was a mystery until one geoscientist made it his personal quest to learn its secrets. Hidden in the dense jungle of the Peruvian Amazon is a percolating, roiling river. The steaming turquoise waters that can reach up to 200 degrees Fahrenheit are guided by ivory-colored stones and guarded by 60-foot walls of lush forest and vegetation. Locals believed that the river was sacred and that the hot waters held healing powers, and shamans incorporated it into medicines. As a child, André Ruzo listened to his Peruvian grandfather tell the story of the Boiling River, or Shanay-timpishka—the ancient name loosely translating to “boiling with the heat of the sun.” The headwaters are marked with a boulder in the shape of a snake’s head. According to legend, a giant serpent spirit called Yacumama or “Mother of the Waters” who gives birth to hot and cold waters heats the river. For 12 years, Ruzo was skeptical that the river truly existed. Then, as he was creating a thermal map of Peru during his graduate studies at Southern Methodist University in Texas, he discovered an unusually large hot spot—one of the largest geothermal features found on any continent. In November 2011, he went on an expedition to central Peru with his aunt to see the Boiling River for himself. From the nearest city Pucallpa, the entire journey took about four hours, including a two-hour drive, 45-minute motorized canoe ride, and an hour hike along muddy jungle paths. The river is protected by the shaman of the small town Mayantuyacu, a secluded healing center. After getting special permission from the shaman to study the water, Ruzo was led by the shaman’s apprentice to the almost four mile stretch of flowing scalding water. The water temperature ranges from 120 degrees up to almost 200 degrees Fahrenheit and reaches 16 feet deep in some places. The mud of the riverbank was too hot to walk on, and if you fell in your skin would be covered in third-degree burns in less than a second. Small unfortunate animals, like frogs, could be found floating dead and broiled in the water, the “eyes always seem to cook first turning milky white,” Ruzo wrote in National Geographic. Ruzo, wearing only sandals, carefully hopped between the small white rocks the size of paper to take samples of different areas of the river. He found that the water averages 187 degrees Fahrenheit, which isn’t quite boiling but is still really hot—steam emanating off the surface. A body of water the size of the Boiling River requires a heat source with a lot of energy, yet the closest active volcano is more than 400 miles away and there are no known magmatic systems in the Amazon jungle. After some investigating and testing different hypotheses, Ruzo and his research colleagues believe that a fault-led hydrothermal feature was causing the river to reach such temperatures. The water seeps deep into the Earth, heats up underground, and resurfaces through faults and cracks. His team is still conducting further research on the river’s unique thermal characteristics. 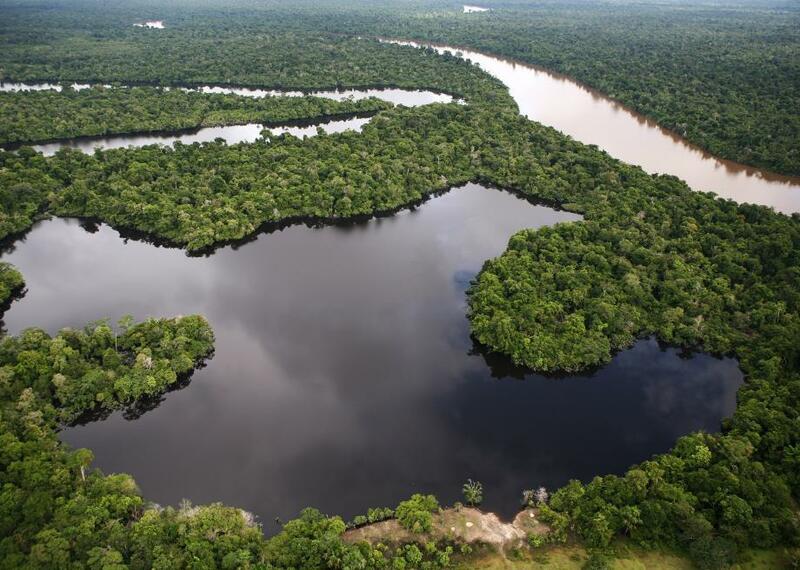 Since his initial visit to the Boiling River, the trip from Pucallpa has been reduced to a three-hour direct drive because of the rapid deforestation and commercialization of the area. To preserve the sacred river, Ruzo started the Boiling River Project to protect and study the natural wonder in a safe manner. Ruzo details his experience with the Boiling River in his book, The Boiling River: Adventure and Discovery in the Amazon.